Finance transformation is actively embracing digital transactions and going paperless with digital invoices, digital payments, and electronic documents. The proliferation of advanced digital technologies – big data, machine learning, artificial intelligence, robotics process automation, chatbots, digital assistants, mobile payments, blockchain, IoT, and many more – presents unprecedented opportunity to disrupt the costly, administrative, and bean-counter mindset of the back-office to give way to a modern data-driven finance organization: a connected, cognitive, cost-effective, and customer-centric finance organization. 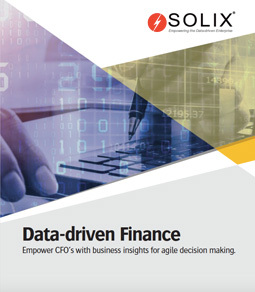 Solix has put together a whitepaper, outlining how CFOs can lead digital transformation with the help of top big data technologies such as Machine Learning and AI. The CFO organizations in an enterprise are looking to drive a competitive edge to business through advanced analytics with data-driven technology solutions such as Emagia Finance Analytics based on the Solix Common Data Platform (CDP) and artificial intelligence with cognitive assistants such as Emagia’s recently launched Gia, a CFO’s virtual assistant. To access the free whitepaper and learn how to employ data-driven finance best practices, fill the form to your right.